We take paper off the desk and floor and help create a well-organized filing and paper managment system. Together we develop an efficient office organization solution that is sustainable and will allow you to find documents quickly. Who needs help organizing their home or office? Whether it's your home or office, Simplify It's Professional Organizers help you sort and get organized so you can stay organized. We are especially sensitive to the needs of our clients with ADD/ADHD. With care and compassion, we help clients filter through the "stuff" in their homes and offices as well as through their paperwork. Then we design a well -organized, easy to follow filing system that leads to quick information retrieval and minimal search time. 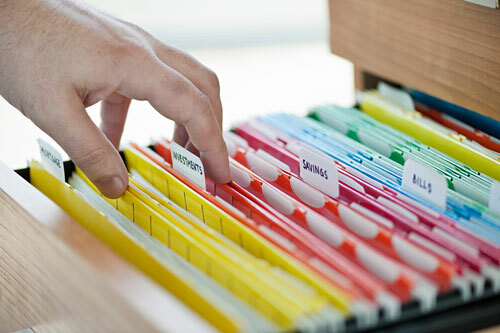 Together we design a well-organized filing system that lets you find any paper in 30 seconds or less. We'll help you find those long lost table and counter tops. Stop tripping over tools and toys and start using the garage for your vehicle! You'll be able to find what you need when you need it, get dressed and off to work or school faster each day, and stop buying things you already have. “My friend’s condo was in a complete shambles. You were able to sift through mountains of junk, sort out the desirable from the undesirable, organize all items into categories, and arrange everything neatly on shelves, in closet and in boxes.